The Premiere Tuesday Plus! with your Bistro Group Premiere Card. Are you one of the lucky ones who have a Bistro Group Premiere Card? Then by all means head on to your favorite Bistro Group restaurant and you get one treat plus another. 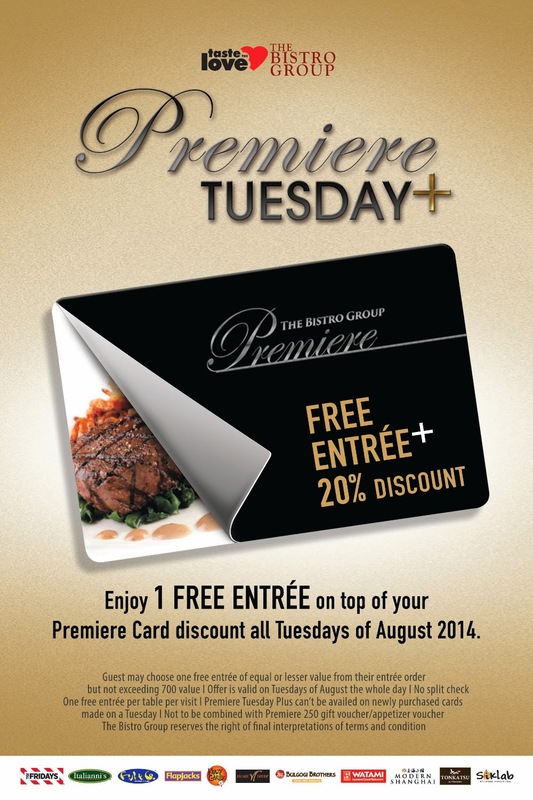 Dine in at any Bistro Group of Restaurants all Tuesdays of August 2014 and have one FREE ENTRÉE on top of your 20% Premiere Card Discount. Now that's a treat! Visit TGI Fridays, Itallianni's, Fish and Co., Flapjacks, Watami, Krazy Garlik, Bulgogi Brothers, Modern Shanghai, Siklab, Tonkatsu by Terazawa, Village Tavern and Siklab to enjoy the Tuesday treat all Tuesdays of August! This is an exclusive offer all Premiere Card members should not miss! Teddy's Bigger Burgers! From Hawaii to Manila! Say Yes to a Monday Afternoon treat at Starbucks! Dimsum Buffet at Crystal Jade Shanghai Delight!! !